Purchasing a vehicle is invigorating for most car buyers. However, a select few will feel the pressure regarding their personal finances and backgrounds. Buying a car is no small investment for either the new potential vehicle owner or the car dealership. First, you need to ensure you can actually afford your new vehicle and the dealership needs to be able to trust you to do so. The experts at Car-Registration.org believe it is important for new car buyers to know what a car dealership has the authority to look into when you prepare to buy a car. Continue below to learn what information a car dealership will check before selling you a vehicle. The first and most important thing that all car dealerships look into when you plan to buy a car is your credit score. Your credit score reveals several bits of information about your spending habits and your financial past. If you have a high credit score, you will have better luck negotiating with your car salesperson. However, if your credit score is exceptionally low, do not expect to have much wiggle room when it comes to negotiations. Your credit score reveals how many current financial accounts are open and if your status with each is in good standing or delinquent. Even if you have 100 different accounts open, as long as you pay all of your bills on time and hit the minimums, you are a good candidate for a car dealership. On the converse, if you have just one outstanding loan that you cannot pay off and have incurred penalties and increased interest, this produces a red flag for the dealership. To access your credit score, you must provide your Social Security Number among other personal information to the salesperson. The experts at Car-Registration.org remind you to look out for a credit report waiver to sign, which indicates the dealership’s intentions for looking into your credit history. The car dealership will request your driver’s license for several reasons. Primarily, if you walk into a car dealership and request to test drive a car off the bat, the salesperson will ask for your driver’s license to confirm you are legally authorized to drive so you can legally test-drive the vehicle of your choice. In addition, when the time comes to sign your new car lease or contract your driver’s license acts as proof of identity. If you plan to buy a new vehicle as a gift for someone else and do not intend to drive it yourself, the team at Car-Registration.org recommends bringing some identifying documentation to present to the dealership, especially if you do not have a current driver’s license. 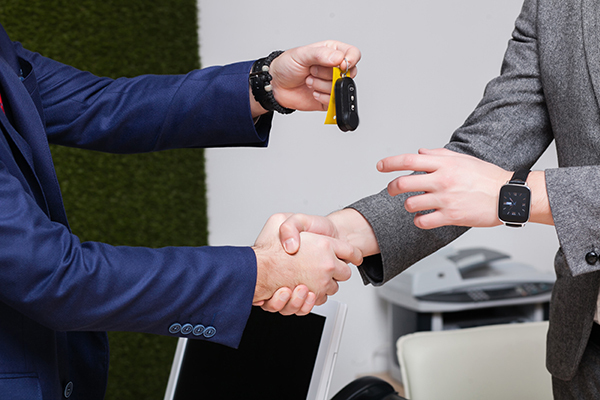 If you are planning to trade in a current vehicle on the same day you want to buy a new vehicle, the car dealership will require you to present several items. First, you must provide proof of ownership. If you outright own your vehicle, bring the title. If you still owe money on the car, the dealership will need the loan paperwork to analyze to arrange assumption of the remainder of your payments as part of your negotiations. The dealership will also request the current car registration. Oftentimes, the car dealership will register your new car on your behalf, but the paperwork may require your current car registration to complete the process. Finally, the team at Car-Registration.org reminds you to bring one or both sets of the keys of the vehicle you are trading, especially if you plan to complete the transaction in the same day. In addition to keys, you may need to hand over other vital items, like the vehicle’s user manual and floor mats. Being prepared is the best way to experience a clean trade-in and transfer.